Chris Detrick | The Salt Lake Tribune Utah Jazz's Donovan Mitchell poses for photos at The Grand America Hotel Wednesday, June 28, 2017. 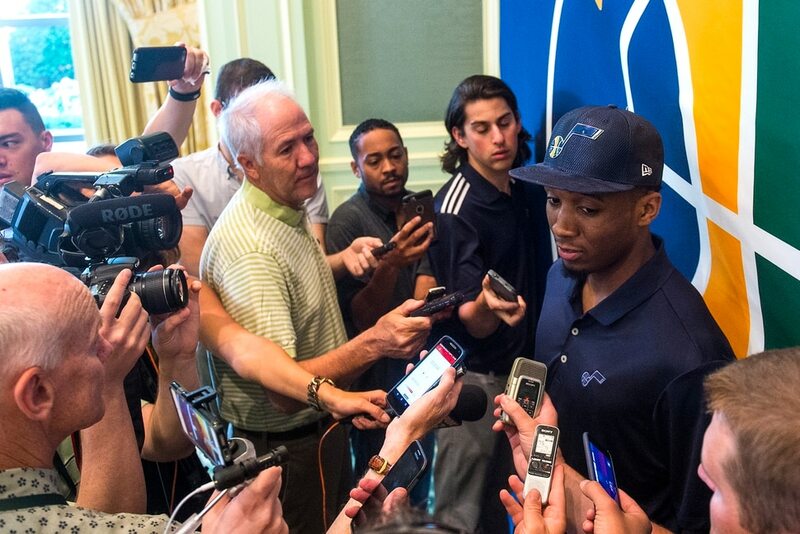 Chris Detrick | The Salt Lake Tribune Utah Jazz's Donovan Mitchell talks with members of the media at The Grand America Hotel Wednesday, June 28, 2017. 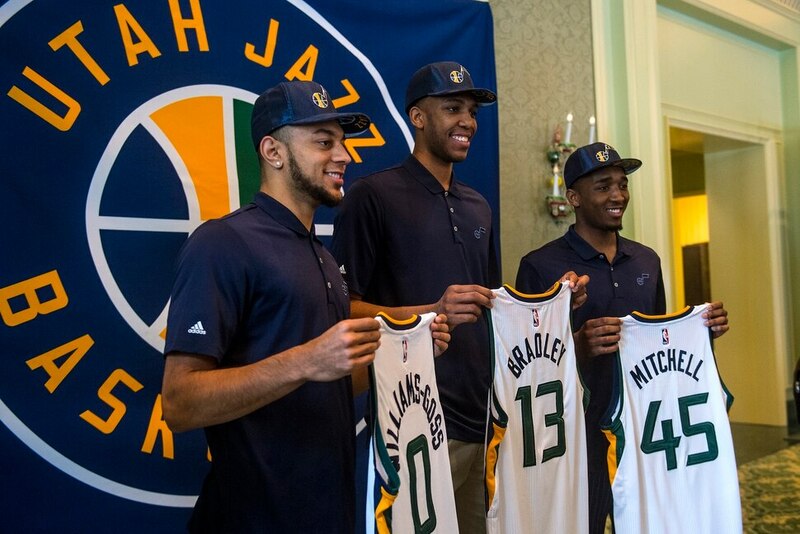 Chris Detrick | The Salt Lake Tribune Utah Jazz's Nigel Williams-Goss, Tony Bradley and Donovan Mitchell pose for photos at The Grand America Hotel Wednesday, June 28, 2017. (Rick Egan | The Salt Lake Tribune) Utah Jazz guard Donovan Mitchell (45) shoots as Los Angeles guard Lonzo Ball (2) defends for the lakers, Saturday, October 28, 2017. (Leah Hogsten | The Salt Lake Tribune) Utah Jazz guard Donovan Mitchell (45) rises to the net. The Utah Jazz lead the Toronto Raptors 54-53 at Vivint Smart Home Arena, Friday, November 3, 2017 (Trent Nelson | The Salt Lake Tribune) Utah Jazz guard Donovan Mitchell (45) shoots as the Utah Jazz host the Chicago Bulls, NBA basketball in Salt Lake City Wednesday November 22, 2017. (Trent Nelson | The Salt Lake Tribune) Utah Jazz guard Donovan Mitchell (45) bobbles the ball as the Utah Jazz host the Milwaukee Bucks, NBA basketball in Salt Lake City Saturday November 25, 2017. (Trent Nelson | The Salt Lake Tribune) Utah Jazz guard Donovan Mitchell (45) celebrates as the Utah Jazz host the Portland Trail Blazers, NBA basketball in Salt Lake City, Wednesday November 1, 2017. (Trent Nelson | The Salt Lake Tribune) Utah Jazz guard Donovan Mitchell (45) as the Utah Jazz host the Portland Trail Blazers, NBA basketball in Salt Lake City, Wednesday November 1, 2017. (Trent Nelson | The Salt Lake Tribune) Utah Jazz guard Donovan Mitchell (45) celebrates a score as the Utah Jazz host the Milwaukee Bucks, NBA basketball in Salt Lake City Saturday November 25, 2017. (Trent Nelson | The Salt Lake Tribune) Utah Jazz guard Donovan Mitchell (45) shoots as the Utah Jazz host the Chicago Bulls, NBA basketball in Salt Lake City Wednesday November 22, 2017. (Trent Nelson | The Salt Lake Tribune) Utah Jazz guard Donovan Mitchell (45) as the Utah Jazz host the Chicago Bulls, NBA basketball in Salt Lake City Wednesday November 22, 2017. (Trent Nelson | The Salt Lake Tribune) Utah Jazz guard Donovan Mitchell (45) as the Utah Jazz host the Portland Trail Blazers, NBA basketball in Salt Lake City, Wednesday November 1, 2017. (Trent Nelson | The Salt Lake Tribune) Utah Jazz guard Donovan Mitchell (45) as the Utah Jazz host the Denver Nuggets, NBA basketball in Salt Lake City, Wednesday October 18, 2017. (Rick Egan | The Salt Lake Tribune) Utah Jazz guard Donovan Mitchell (45) talks to Los Angeles Lakers guard Kentavious Caldwell-Pope (1) after the Jazz defeated the Lakers 96-81, in NBA action, in Salt Lake City, Saturday, October 28, 2017. (Chris Detrick | The Salt Lake Tribune) Utah Jazz guard Donovan Mitchell (45) during the game at Vivint Smart Home Arena Friday, December 1, 2017. Utah Jazz defeated New Orleans Pelicans 114-108. (Trent Nelson | The Salt Lake Tribune) Utah Jazz guard Donovan Mitchell (45) goes up for a dunk (missed) as the Utah Jazz host the Chicago Bulls, NBA basketball in Salt Lake City Wednesday November 22, 2017. (Leah Hogsten | The Salt Lake Tribune) Utah Jazz guard Donovan Mitchell (45). The Utah Jazz defeated the Phoenix Suns 112-101 during preseason NBA basketball at Vivint Smart Home Arena in Salt Lake City, October 6, 2017. (Chris Detrick | The Salt Lake Tribune) Utah Jazz guard Donovan Mitchell (45) runs past New Orleans Pelicans forward Anthony Davis (23) during the game at Vivint Smart Home Arena Friday, December 1, 2017. (Steve Griffin | The Salt Lake Tribune) Utah Jazz guard Donovan Mitchell (45) drives past the Denver defense during the Utah Jazz versus Denver Nuggets NBA basketball game at Vivint Smart Home Arena in Salt Lake City Tuesday November 28, 2017. (Rick Egan | The Salt Lake Tribune) Utah Jazz guard Donovan Mitchell (45) reacts after hitting a big three-pointer late in the game, in NBA action, Utah Jazz vs. Los Angeles Lakers, in Salt Lake City, Saturday, October 28, 2017. (Rick Egan | The Salt Lake Tribune) Utah Jazz guard Donovan Mitchell (45) takes the ball inside as Houston Rockets forward Ryan Anderson (33) in NBA action, Utah Jazz vs Houston Rockets in Salt Lake City, Thursday, December 7, 2017. (Rick Egan | The Salt Lake Tribune) Utah Jazz guard Donovan Mitchell (45) steals the ball from Cleveland Cavaliers forward Cedi Osman (16), in NBA action Utah Jazz vs Cleveland Cavaliers, in Salt Lake City, Saturday, December 30, 2017. (Trent Nelson | The Salt Lake Tribune) Utah Jazz guard Donovan Mitchell (45) reacts to a 13-point deficit as the Utah Jazz host the Oklahoma City Thunder, NBA basketball in Salt Lake City, Saturday December 23, 2017. (Trent Nelson | The Salt Lake Tribune) Utah Jazz guard Donovan Mitchell (45) drives on Denver Nuggets forward Wilson Chandler (21) as the Utah Jazz host the Denver Nuggets, NBA basketball in Salt Lake City, Wednesday October 18, 2017. (Trent Nelson | The Salt Lake Tribune) Utah Jazz guard Donovan Mitchell (45) shoots past Chicago Bulls center Robin Lopez (42) as the Utah Jazz host the Chicago Bulls, NBA basketball in Salt Lake City Wednesday November 22, 2017. (Chris Detrick | The Salt Lake Tribune) Utah Jazz guard Donovan Mitchell (45) is fouled by New Orleans Pelicans guard Tony Allen (24) as he attempts to dunk during the game at Vivint Smart Home Arena Friday, December 1, 2017. (Trent Nelson | The Salt Lake Tribune) Utah Jazz guard Donovan Mitchell (45) drives around Milwaukee Bucks guard Malcolm Brogdon (13) as the Utah Jazz host the Milwaukee Bucks, NBA basketball in Salt Lake City Saturday November 25, 2017. (Chris Detrick | The Salt Lake Tribune) Utah Jazz guard Donovan Mitchell (45) is fouled by New Orleans Pelicans guard Tony Allen (24) as he attempts to dunk during the game at Vivint Smart Home Arena Friday, December 1, 2017. (Trent Nelson | The Salt Lake Tribune) Utah Jazz guard Donovan Mitchell (45) defended by Oklahoma City Thunder center Steven Adams (12) as the Utah Jazz host the Oklahoma City Thunder, NBA basketball in Salt Lake City, Saturday December 23, 2017. (Trent Nelson | The Salt Lake Tribune) Utah Jazz guard Donovan Mitchell (45) shoots over Chicago Bulls center Robin Lopez (42) as the Utah Jazz host the Chicago Bulls, NBA basketball in Salt Lake City Wednesday November 22, 2017. (Trent Nelson | The Salt Lake Tribune) Utah Jazz guard Donovan Mitchell (45) drives on Denver Nuggets forward Wilson Chandler (21) as the Utah Jazz host the Denver Nuggets, NBA basketball in Salt Lake City, Wednesday October 18, 2017. (Chris Detrick | The Salt Lake Tribune) Utah Jazz guard Donovan Mitchell (45) and Utah Jazz forward Joe Ingles (2) during the game at Vivint Smart Home Arena Friday, December 1, 2017. Utah Jazz defeated New Orleans Pelicans 114-108. (Steve Griffin | The Salt Lake Tribune) Utah Jazz guard Donovan Mitchell (45) steals the ball and heads up court during the Utah Jazz versus Denver Nuggets NBA basketball game at Vivint Smart Home Arena in Salt Lake City Tuesday November 28, 2017. (Steve Griffin | The Salt Lake Tribune) Utah Jazz guard Donovan Mitchell (45) shrugs as the Jazz fall to the New Orleans Pelicans in their NBA basketball game at the Vivint Smart Home Arena in Salt Lake City Wednesday January 3, 2018. (Steve Griffin | The Salt Lake Tribune) Utah Jazz forward Joe Ingles (2) and Utah Jazz guard Donovan Mitchell (45) cheer on their teammates during the Utah Jazz versus Denver Nuggets NBA basketball game at Vivint Smart Home Arena in Salt Lake City Tuesday November 28, 2017. (Steve Griffin | The Salt Lake Tribune) Utah Jazz guard Donovan Mitchell (45) drives up court during the the Utah Jazz versus the New Orleans Pelicans NBA basketball game at the Vivint Smart Home Arena in Salt Lake City Wednesday January 3, 2018. (Leah Hogsten | The Salt Lake Tribune) Utah Jazz guard Donovan Mitchell (45) is fouled by Toronto Raptors forward Norman Powell (24). The Utah Jazz were defeated by the Toronto Raptors 100-109 at Vivint Smart Home Arena, Friday, November 3, 2017 (Leah Hogsten | The Salt Lake Tribune) Utah Jazz guard Donovan Mitchell (45) fights for the rebound under the net. The Utah Jazz defeated the Phoenix Suns 112-101 during preseason NBA basketball at Vivint Smart Home Arena in Salt Lake City, October 6, 2017. (Rick Egan | The Salt Lake Tribune) Utah Jazz guard Ricky Rubio (3) reacts after Utah Jazz guard Donovan Mitchell (45) hit a big three-pointer late in the game, in NBA action, Utah Jazz vs. Los Angeles Lakers, in Salt Lake City, Saturday, October 28, 2017. (Rick Egan | The Salt Lake Tribune) Utah Jazz guard Donovan Mitchell (45) tries to pass the ball, as Houston Rockets forward Trevor Ariza (1) defends, in NBA action, Utah Jazz vs Houston Rockets in Salt Lake City, Thursday, December 7, 2017. (Rick Egan | The Salt Lake Tribune) Jazz fans celebrate as Donovan Mitchell (45) extends the lead for the Jazz, with a dunk late in the 4th quarter, in NBA action Utah Jazz vs Cleveland Cavaliers, in Salt Lake City, Saturday, December 30, 2017. (Rick Egan | The Salt Lake Tribune) Utah Jazz guard Donovan Mitchell (45) scores to pu the Jazz up 62-56, as Cleveland Cavaliers forward LeBron James (23) defends, in NBA action Utah Jazz vs Cleveland Cavaliers, in Salt Lake City, Saturday, December 30, 2017. (Rick Egan | The Salt Lake Tribune) Utah Jazz guard Donovan Mitchell (45) reacts as Utah Jazz forward Joe Ingles (2) extends the Jazz lead with a 3-point-shot, in NBA action Utah Jazz vs Cleveland Cavaliers, in Salt Lake City, Saturday, December 30, 2017. (Chris Detrick | The Salt Lake Tribune) Utah Jazz guard Donovan Mitchell (45) celebrates after being fouled and still making the basket during the game at Vivint Smart Home Arena Friday, December 1, 2017. Utah Jazz defeated New Orleans Pelicans 114-108. (Chris Detrick | The Salt Lake Tribune) Utah Jazz guard Donovan Mitchell (45) celebrates after being fouled and still making the basket during the game at Vivint Smart Home Arena Friday, December 1, 2017. Utah Jazz defeated New Orleans Pelicans 114-108. (Rick Egan | The Salt Lake Tribune) Utah Jazz guard Donovan Mitchell (45) reacts after Sefolosha (22) and Cleveland Cavaliers forward LeBron James (23), got double technical fouls called on them after a little argument on the court , in NBA action Utah Jazz vs Cleveland Cavaliers, in Salt Lake City, Saturday, December 30, 2017. (Trent Nelson | The Salt Lake Tribune) Oklahoma City Thunder forward Paul George (13) and Oklahoma City Thunder guard Russell Westbrook (0) embrace and talk to Utah Jazz guard Donovan Mitchell (45) after the Utah Jazz lost to the Oklahoma City Thunder, NBA basketball in Salt Lake City, Saturday December 23, 2017. (Trent Nelson | The Salt Lake Tribune) Utah Jazz guard Donovan Mitchell (45) drives while Utah Jazz center Rudy Gobert (27) sets a pick on Portland Trail Blazers guard Damian Lillard (0) as the Utah Jazz host the Portland Trail Blazers, NBA basketball in Salt Lake City, Wednesday November 1, 2017. Donovan Mitchell once seemed surprised that anyone would marvel about how he immersed himself in the community as a Jazz rookie. That explains how Mitchell so quickly has become the Most Influential Person in Utah Sports, as judged by The Salt Lake Tribune sports staff. Mitchell personally lifted the Jazz to a close-out victory in their playoff series with Oklahoma City by scoring 38 points in Game 6 after Ricky Rubio was injured. His impact went far beyond the court. The way Mitchell validated Utah as a great place to live and work, the way he treated people and the way he made the Jazz fun again turned him into one of the NBA's biggest stories in 2018. So for three years in a row, Gordon Hayward has influenced the Most Influential rankings. He was No. 1 in 2016, when everyone figured the free agency decision he would make in the coming year would forever impact the Jazz. Rudy Gobert succeeded him last summer, as Jazz fans rallied around Gobert in an effort to move on from Hayward, who had departed to Boston. 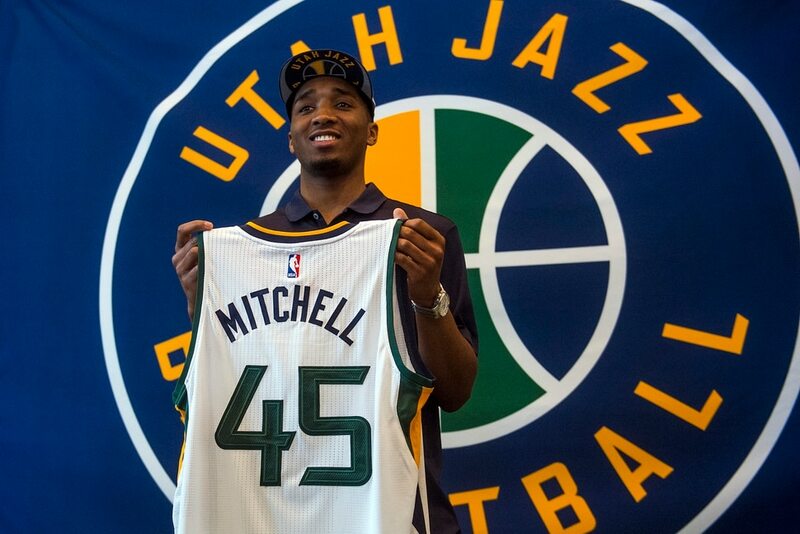 And then came Mitchell, whose emergence has more than compensated for the loss of Hayward. He’s a gift to an entire state, through his personal interactions with fans and his ability to unite fans behind Utah’s flagship pro sports franchise. Utahns like people who like Utah. Mitchell loves Utah, and Utahns love him. Those mutual feelings seem unlikely to change any time soon. Lindsey lost ground on this list last summer after failing to retain Gordon Hayward in free agency, but he responded impressively by assembling a team that returned to the Western Conference semifinals. 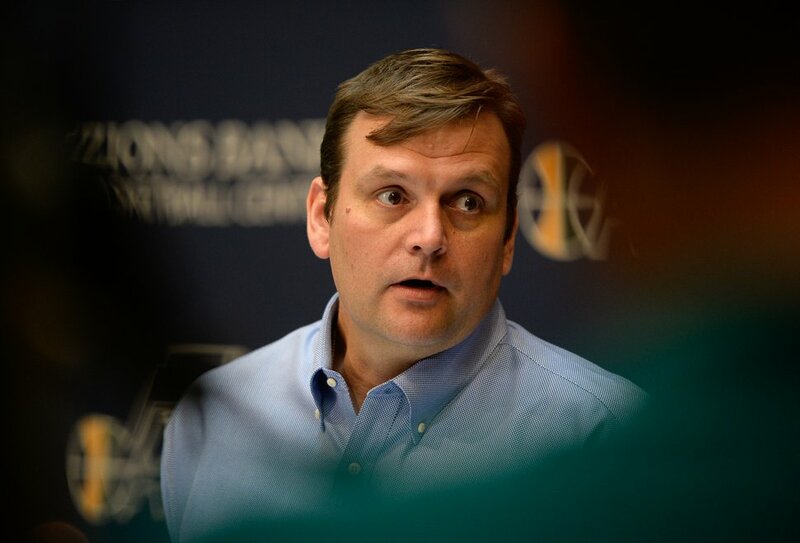 The Jazz's investment in Joe Ingles and the discovery of Royce O'Neale were hallmark moves of Lindsey's tenure, beyond the shrewd drafting of Donovan Mitchell. Lindsey finished second in his peers' voting for NBA Executive of the Year. Snyder placed second in the media's balloting for NBA Coach of the Year after steering the Jazz through the loss of Hayward and posting one of the league's best records (31-10) in the second half of the 2017-18 season. The Jazz's first-round playoff series victory over Oklahoma City showcased Snyder's skills vs. Thunder coach Billy Donovan. He has adapted to his personnel, building a defense-oriented team while developing a more efficient offense. 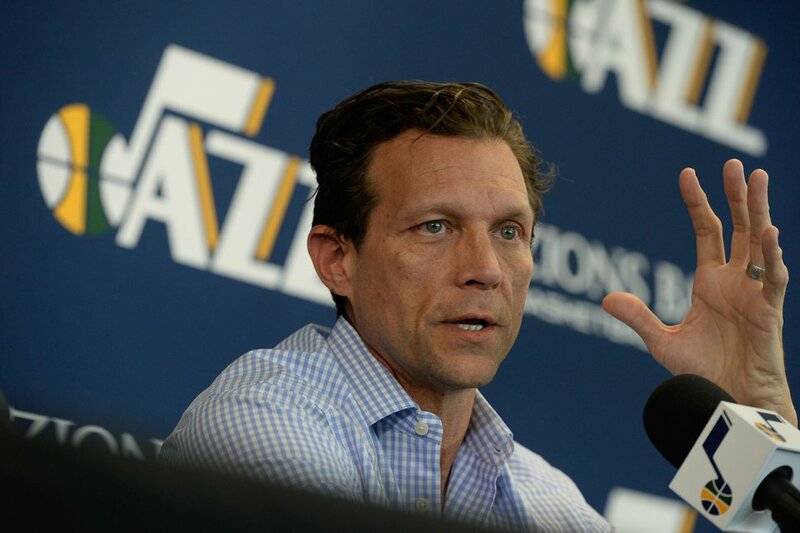 (Francisco Kjolseth | The Salt Lake Tribune) Utah Jazz head coach Quin Snyder speaks with the media during exit interviews at their practice facility in Salt Lake City Wed., May 8, 2018, after losing to the Houston Rockets in game 5 of their Western Conference Finals during the 2018 NBA Playoffs. 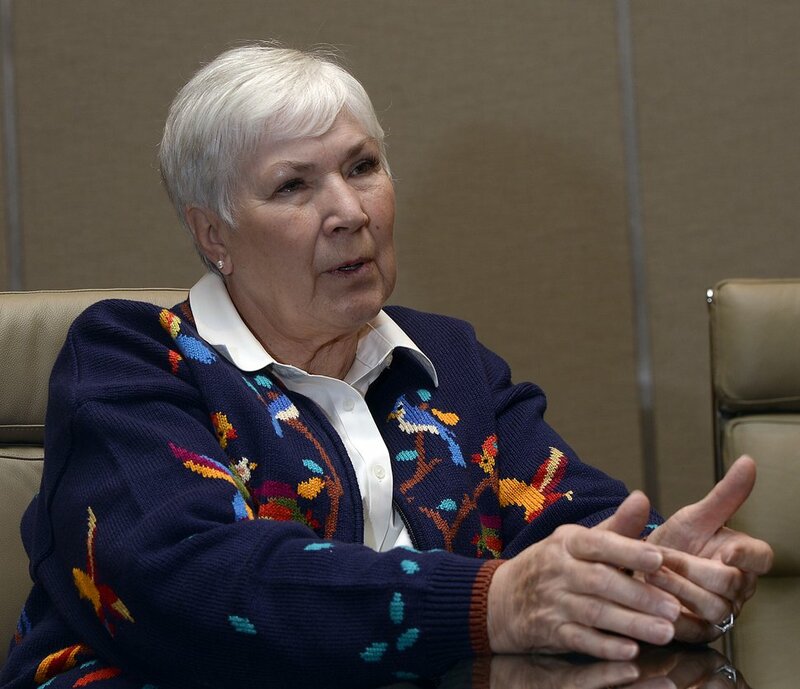 Al Hartmann | The Salt Lake Tribune The Larry H. Miller businesses and Utah Jazz have blossomed under the leadership of owner Gail MIller. She has raised her public profile through her community activism on several issues, like the homeless situation and Count My Vote. 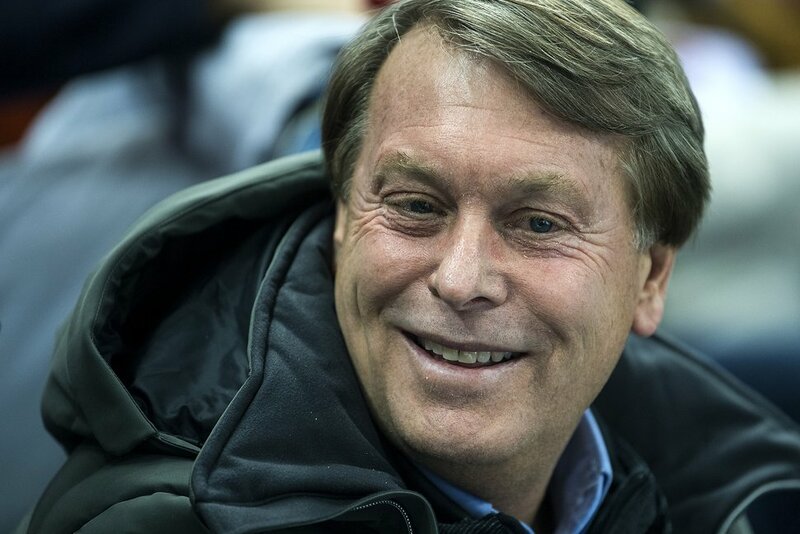 Hansen's stepping forward to acquire a National Women's Soccer League team has widened his profile and expanded the RSL brand to a third league. 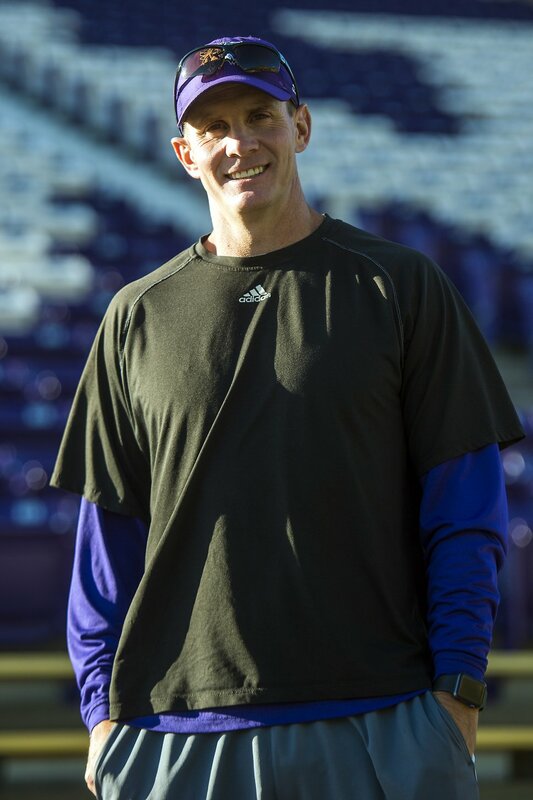 Hansen is credited as a driver in the growth of women's soccer, with the Royals averaging 8,555 fans. Real Salt Lake, the Utah Royals FC and the Real Monarchs each has a niche in the soccer market, playing in stadiums in Sandy and Herriman, where Hansen has developed the Zions Bank Training Center and the Real Academy. 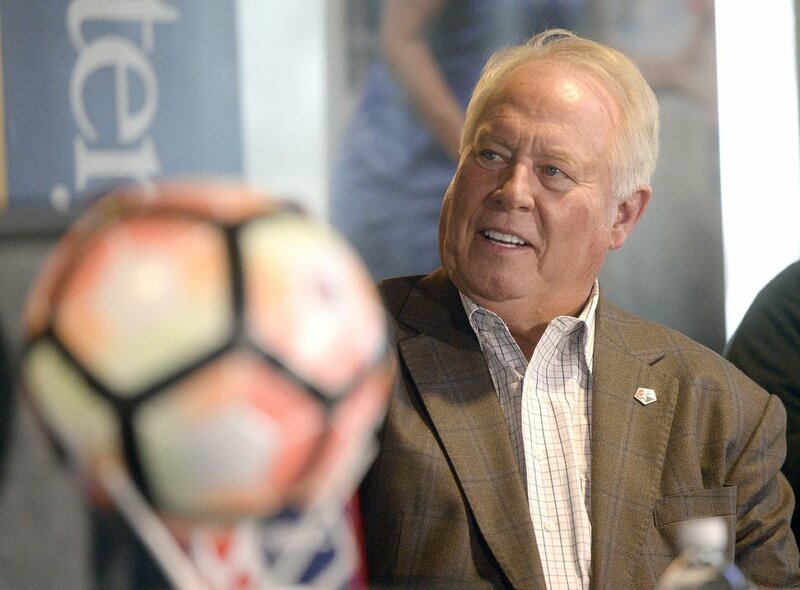 (Al Hartmann | The Salt Lake Tribune) Real Salt Lake owner Dell Loy Hansen announced that the National Women's Soccer League (NWSL) will field a team in Utah for the 2018 season. Whittingham's drop in the rankings stems from Utah's 3-6 record in Pac-12 play last season, combined with the Jazz's resurgence in the market. Even so, his program is positioned for a breakthrough in the next two seasons, with the Utes' best collection of talent in at least a decade. Utah has received endorsements as a Pac-12 South contender in 2018 and should remain strong with only 12 scholarship seniors on the roster and a more favorable conference schedule in 2019. (Rick Egan | The Salt Lake Tribune) Kyle Whittingham is entering his 14th year as Utah head coach, Wednesday, Aug. 15, 2018. The Utah Sports Commission in 2017 reported its partnership in 49 events, resulting in $158 million in economic impact and 723 broadcast hours, promoting the state. Everywhere you look, the commission is bringing another diverse competition to Utah. Due to his work with the Salt Lake Olympic Exploratory Committee, Robbins will become even more of a major player in the coming year. The committee voted in February to pursue the 2026 or 2030 Winter Games. (Chris Detrick | The Salt Lake Tribune) Utah Sports Commission President and CEO Jeff Robbins watches the United States vs Olympic Athletes from Russia hockey game at Gangneung Hockey Centre during the Pyeongchang 2018 Winter Olympics Saturday, Feb. 17, 2018. Olympic Athletes from Russia defeated United States 4-0. Gobert earned the No. 1 ranking in 2017, having succeeded in rallying Jazz fans who were disturbed about Hayward's departure wondered about the franchise's future. Donovan Mitchell's emergence served to reduce Gobert's profile, but he won the NBA Defensive Player of the Year award even while playing in only 56 regular-season games, due to injury. Gobert symbolizes the Jazz's effort to defy NBA trends by building their team around a traditional center. 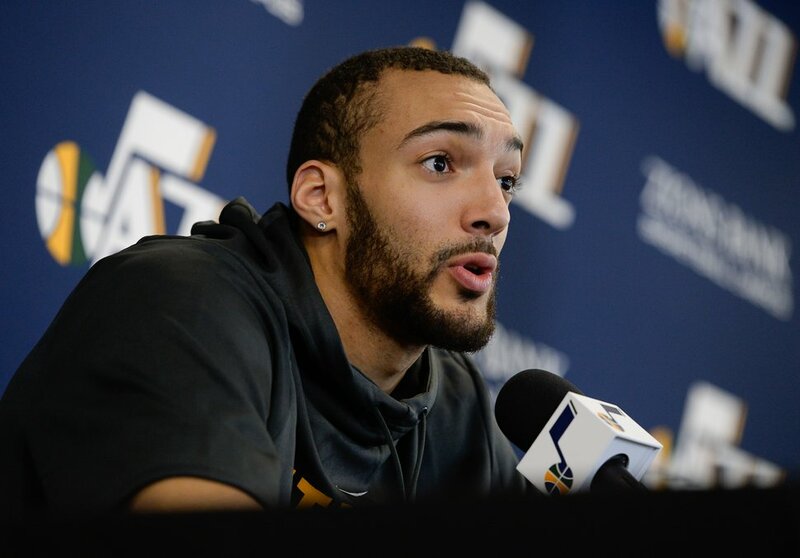 (Francisco Kjolseth | The Salt Lake Tribune) Utah Jazz center Rudy Gobert speaks with the media during exit interviews at their practice facility in Salt Lake City Wed., May 8, 2018, after losing to the Houston Rockets in game 5 of their Western Conference Finals during the 2018 NBA Playoffs. Named in April to Sports Business Journal's “40 Under 40” list of rising stars in sports administration, Starks has a job description that goes beyond the Jazz as the president of Larry H. Miller Sports & Entertainment. Vivint Smart Home Arena, the Tour of Utah and the Salt Lake Bees impact sports fans. Starks' launch of the Beehive Classic college basketball doubleheader did not go well, however; another test will come in December when the event includes Utah vs. BYU. 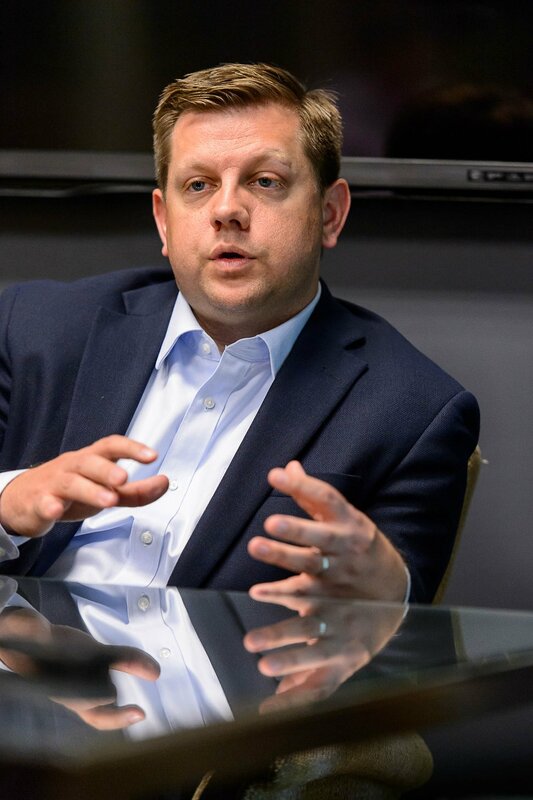 Trent Nelson | The Salt Lake Tribune Steve Starks got his start in business shadowing Larry H. Miller, now the Weber County man is in charge of Miller's sports and entertainment empire. Starks was photographed at EnergySolutions Arena on Thursday June 4, 2015. 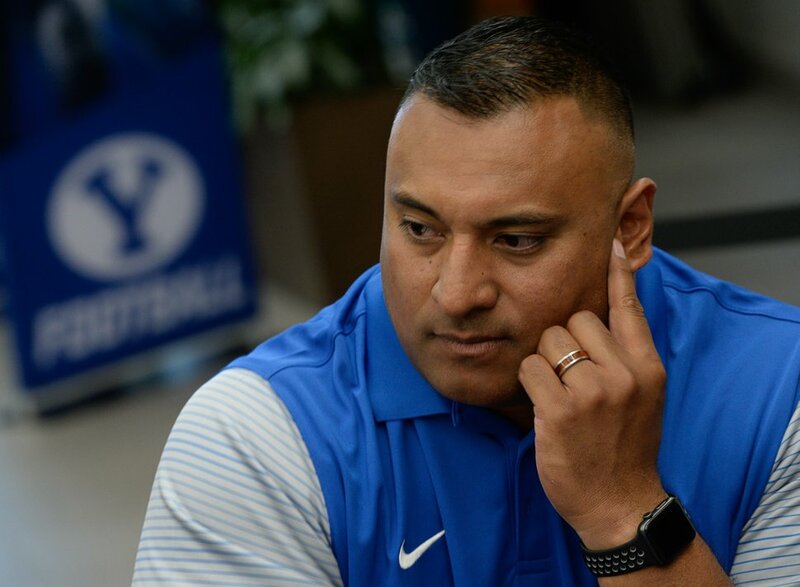 The perception of Sitake’s program changed dramatically last season, when the Cougars' 4-9 record was their worst winning percentage since 1970. Sitake overhauled his offensive coaching staff in an effort to solve major issues after the team’s 2017 showing, and BYU is viewed as needing to improve just to qualify for a bowl game this season. Anything resembling last year’s record would bring Sitake’s job status into question. He’s 13-13 in two seasons. 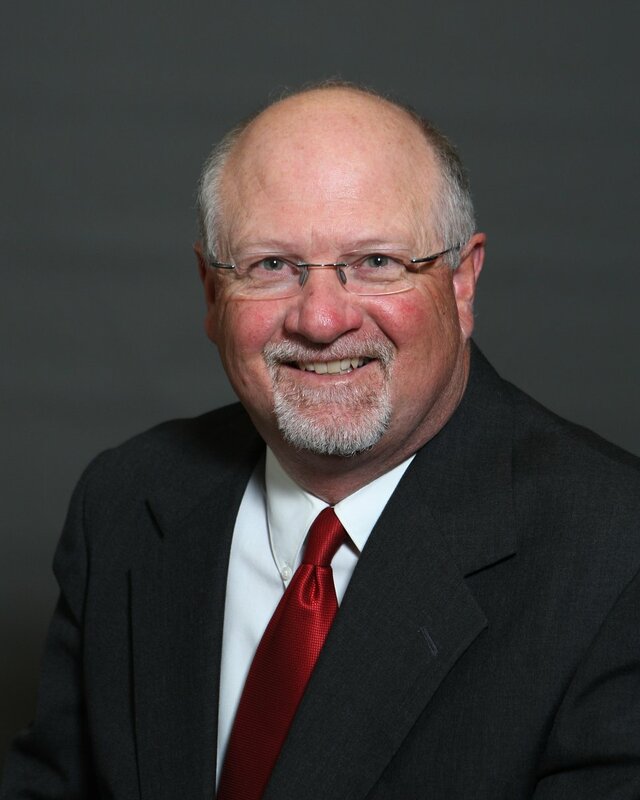 Holmoe moves up in status among the state’s athletic directors after 13 years on the job, with 31-year veteran Chris Hill of Utah having retired. The Cougars' dropoff — or leveling off — in the flagship sports of football and men’s basketball obscures the athletic department’s success in other areas. Holmoe’s tenure, whenever it ends, will be judged by how well independence worked for the football program, with BYU having last played in a conference in 2010. 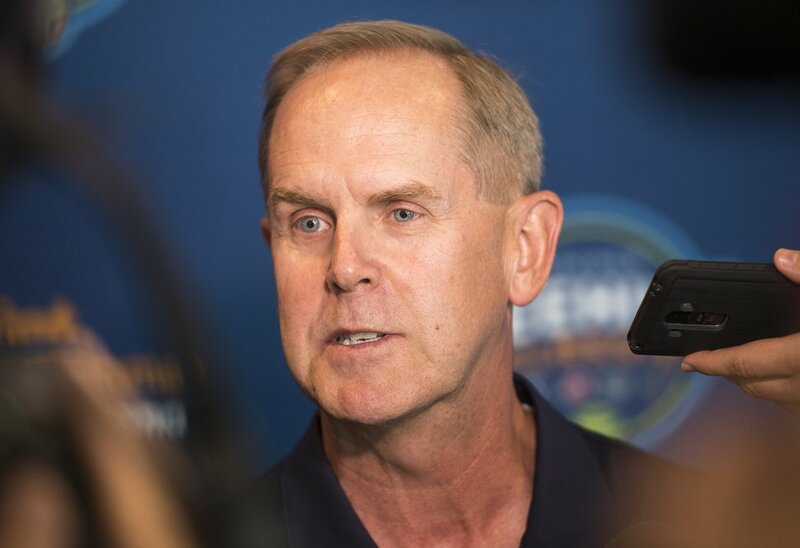 Rick Egan | The Salt Lake Tribune Tom Holmoe, Athletic Director, Brigham Young University, talks about the new menÕs college basketball showcase featuring BYU, Utah, USU, and Weber State, at Vivint Smart Home Arena, Thursday, July 21, 2016. Entering his eighth season with the Utes, Krystkowiak has maintained consistency, while not satisfying all of the program’s fans. The Utes have finished fourth or better in the Pac-12 each of the past four seasons, but have gone two years without playing in the NCAA Tournament. Krystkowiak took Utah to the NIT championship game and has produced his best recruiting class, giving his program much more athleticism going into 2018-19 and beyond. 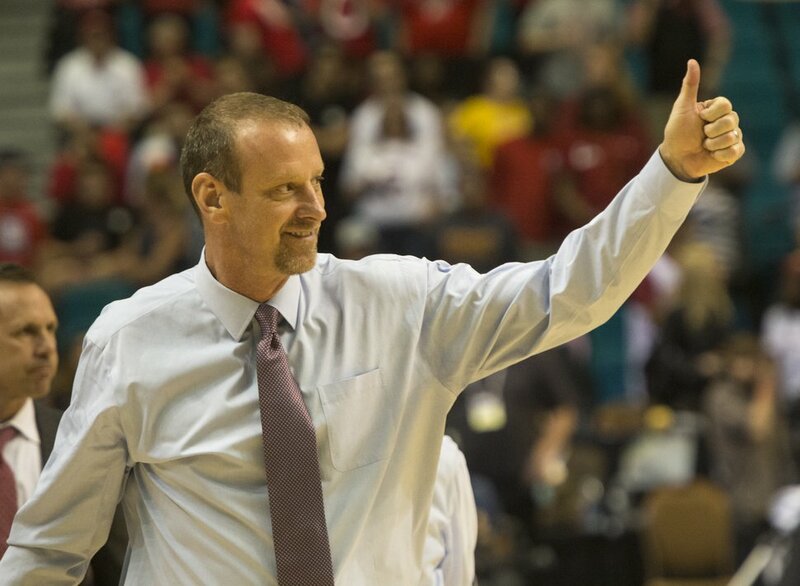 Rick Egan | The Salt Lake Tribune Utah Utes head coach Larry Krystkowiak salutes the Utah fans as he leaves the court after Utah's 80-72, in PAC-12 Basketball Championship action, at the MGM Arena, in Las Vegas, Thursday, March 10, 2016. Harlan remains both a novelty and a mystery, being new to the job after being targeted in the school's first search for an AD since 1987. He made a good impression in his introductory news conference and has a strong background, coming from South Florida after stints at Arizona and UCLA of the Pac-12. The proposed expansion of Rice-Eccles Stadium is Harlan's immediate opportunity to impress the Ute fan base, as he formulates that plan. The West High School graduate is a strong contender for the U.S. Ryder Cup team. 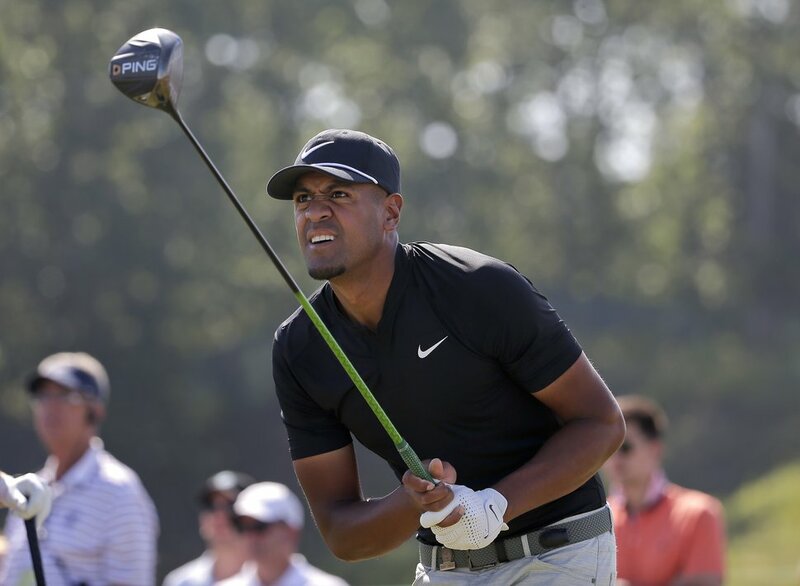 An appearance in the high-profile competition vs. Europe in Paris in late September would cap a season when Finau finished in the top 10 of three major tournaments and made the 36-hole cut in the other. Once known for his prodigious drives, Finau has proven to be a well-rounded player, capable of winning majors someday. He's also mindful of his Rose Park roots. 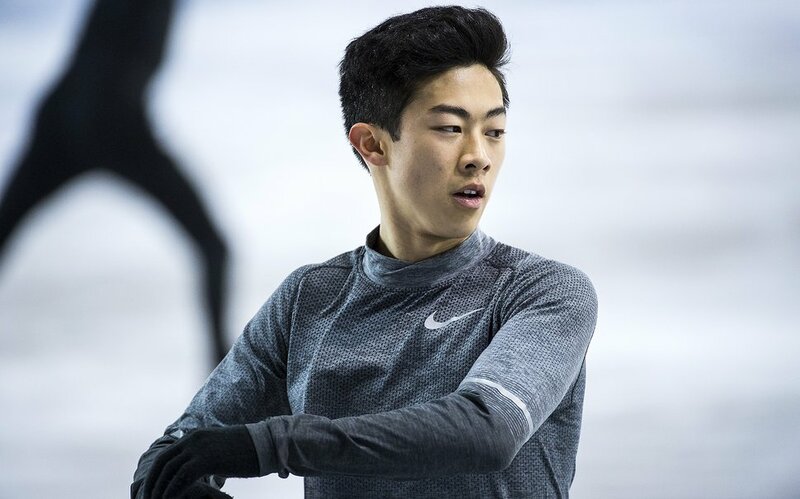 The reality of the Olympics is that casual fans pay attention to sports such as figure skating only every four years, and Chen will remain known for the disastrous short program that placed him 17th in the men's event in Korea. But he deserves credit for coming back to finish fifth overall, thanks to a record six quadruple jumps and a top ranking in free skate. The Salt Lake City native then won a world championship in March and will be a big story in Beijing in 2022. (Chris Detrick | The Salt Lake Tribune) Salt Lake City's Nathan Chen practices his Men's Single Skating Short Program for the Team Event at the Gangneung Ice Arena Thursday, February 8, 2018. Based strictly on his coaching performance, Petke would not move up in the 2018 rankings with RSL standing 10-10-5 prior to Saturday’s game. Judged by the fan base’s regard for him, though, Petke is in a class with Snyder and Whittingham. He’s “Mike Freakin' Petke” to RSL supporters, who love his brash, outspoken way of battling with Major League Soccer administrators. 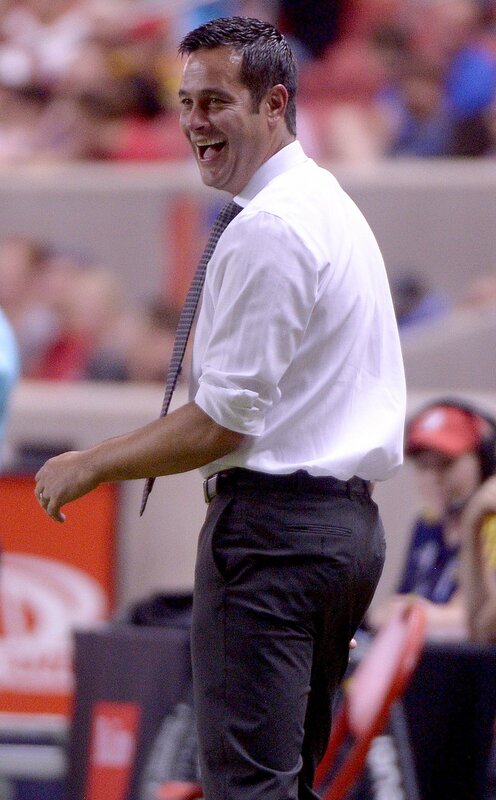 At some point, Petke will have to win playoff games to justify the level of admiration. (Leah Hogsten | The Salt Lake Tribune) Real Salt Lake head coach Mike Petke celebrates the win. Real Salt Lake defeated the Colorado Rapids 4-1 for the Rocky Mountain Cup at Rio Tinto Stadium, Saturday, August 26, 2017. 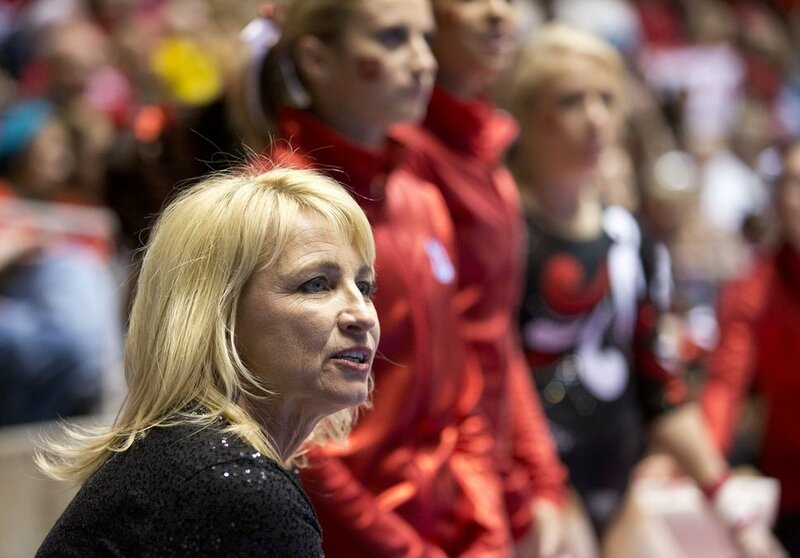 Led by former U.S. Olympic team alternate MyKayla Skinner, the Utes reached the NCAA’s Super Six finals again in 2018, placing fifth. The standards will get higher this season, with the NCAA adopting a final four format. Regardless, Utah gymnastics will remain a marketing phenomenon. The Red Rocks claimed an eighth title in NCAA women’s all-sports attendance, averaging 15,139 fans. Marsden earned her 200th victory as a co-head coach in nine seasons; she’s 201-72-3 in that role. Lennie Mahler | The Salt Lake Tribune Co-head coach Megan Marsden observes the Red Rocks as they warm up on the uneven bars in a meet against Oregon State, West Virginia, and SUU at the Huntsman Center, Saturday, Jan. 19, 2013. The Red Rocks edged the competition with a final score of 196.950, followed by Oregon State with a score of 195.950. 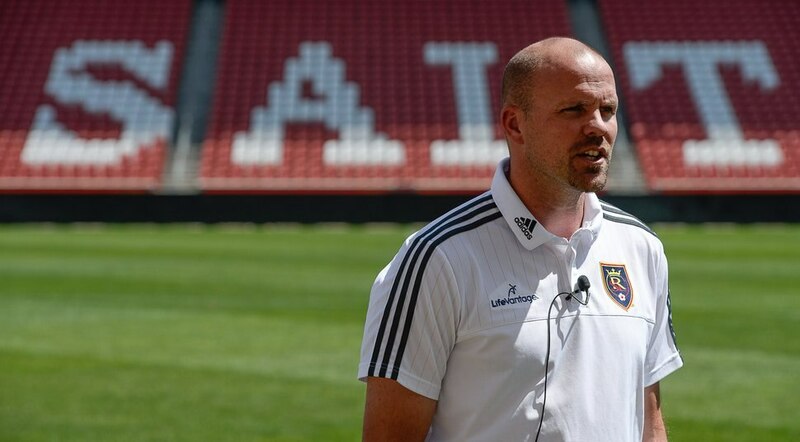 The franchise’s acquisition of the Utah Royals FC women’s team expanded Waibel’s duties in a year when he has continued his effort to rebuild RSL into an MLS playoff team. He’s in the last year of his contract and, as will seemingly always be the case in Hansen’s ownership tenure, questions persist about the GM’s future. “I want to be here. I want to finish this,” Waibel told The Tribune in July. RSL’s making the 2018 playoffs undoubtedly would help his cause. Francisco Kjolseth | The Salt Lake Tribune RSL Technical Director Craig Waibel speaks with the media regarding the announcement of player Juan Manuel Martinez, nicknamed 'El Burrito,' who was officially introduced as the newest player at RSL after a standout career at one of the best clubs in South America, Boca Juniors. Counting his seven years as the coach of Dixie State, then a junior college, Rose is four wins short of 500 for his career. 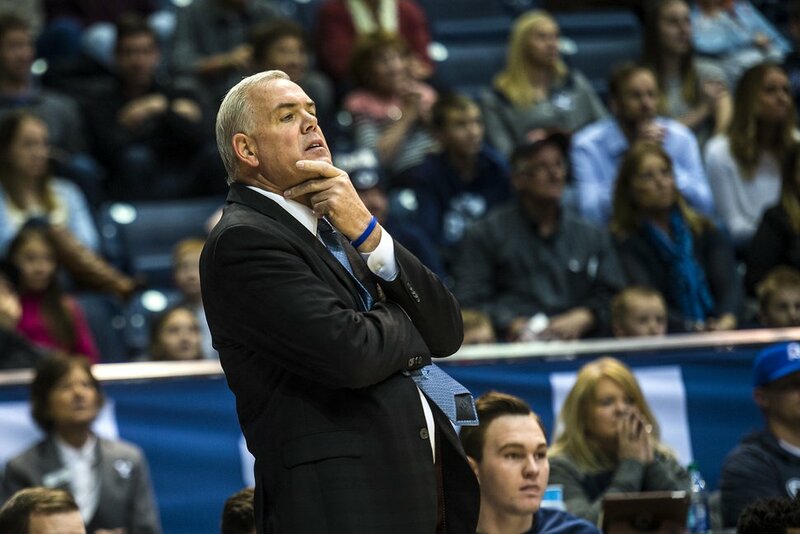 He has taken BYU to the NCAA Tournament or the NIT in each of his 13 seasons, although the program has leveled off with three straight NIT appearances. The Cougars upset Saint Mary’s to reach the championship game of the 2018 West Coast Conference tournament, but got routed by Gonzaga offset that achievement. Wells' tenure is a classic case of providing arguments on both sides. Some observers give him credit for taking the Aggies to four bowl games in five seasons; others point out he has not topped six wins since going 10-4 in 2014. Either way, this is a pivotal year for Wells, whose contract runs through 2019. The Aggies were picked fourth in their division of the Mountain West, but magazine publisher Phil Steele tabbed them the No. 2 most improved team in the country, coming off a 6-7 season. 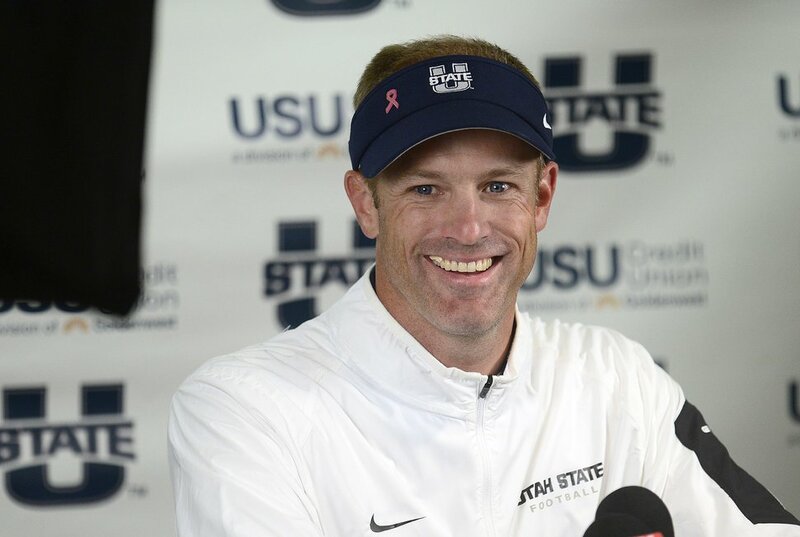 Scott Sommerdorf | The Salt Lake Tribune In a post-game interview, Utah State Aggies head coach Matt Wells laughs as he says the only thing he was upset about was he "didn't know who to give the game balls to" after Utah State defeated Boise State 52-26 in Logan, Friday, October 15, 2015. The 2018 season produced a collective downturn for the state’s FBS programs, with a combined 17-22 record. In contrast, Utah’s two FCS schools made history at that level. Weber State and Southern Utah tied for the Big Sky Conference championship and met in the FCS playoffs' round of 16, with WSU advancing — and then almost upsetting No. 1 James Madison on the road. Hill and Warren are considered rising stars in the profession. Olmstead took the Cougars to the NCAA Final Four for a third straight year, adding to his unique credentials in BYU’s athletic history. The Cougars lost to host UCLA in the semifinals after reaching the title match each of the previous two years. 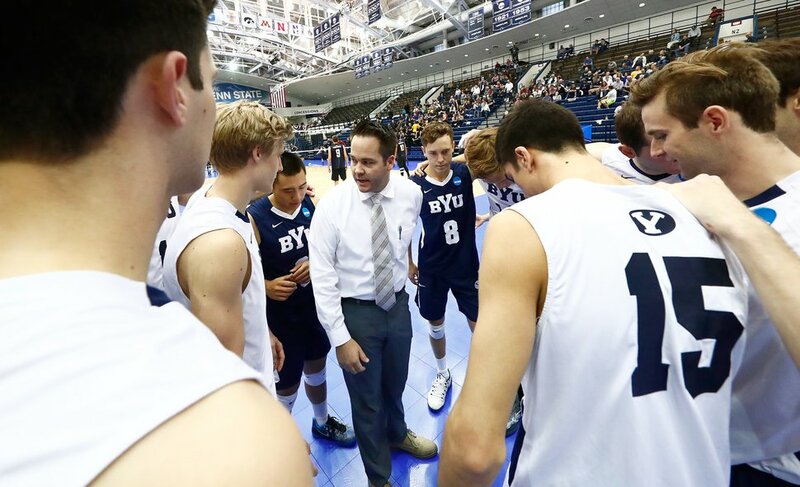 Olmstead’s work with the men’s program has come after he coached the BYU women’s team for four years, reaching the national championship match in 2014. His sister, Heather, has extended the Cougar women’s success. 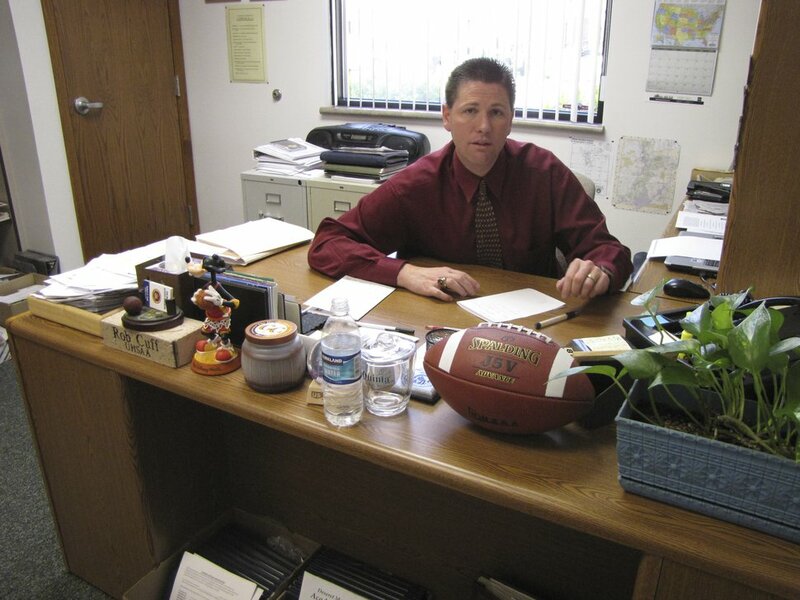 Cuff is beginning his 10th school year in charge of the Utah High School Activities Association, after spending eight years on the staff. In July, Cuff was appointed to a four-year term on the board of directors of the National Federation of High Schools, representing Section 7. The UHSAA administers activities in six classifications, with more than 150 member schools and 90,000 participants. Cuff was a successful basketball coach before moving into administration. Having joined the Wildcats in July, Harris is the first African-American woman to serve as head coach any Division I collegiate team in Utah. She worked most recently at Rhode Island, after being a University of Utah assistant from 2009-15 under Elaine Elliott and Anthony Levrets. A mother of three, Harris played for Portland State and launched her coaching career at the high school level in Oregon. “This is a historic hire,” WSU athletic director Jerry Bovee said. 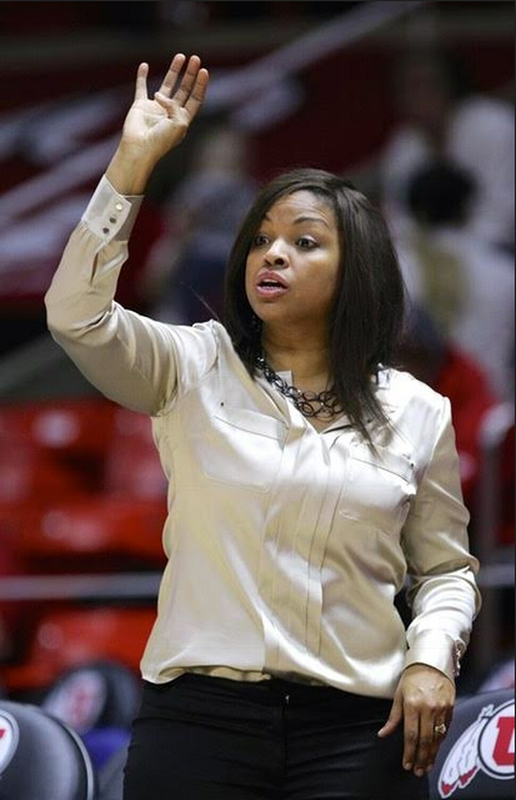 New Weber State women's basketball coach Velaida Harris. The current Buzz/Stingers/Bees franchise is nearing the end of its 25th season in the Pacific Coast League. Amicone has run the operation since since Larry H. Miller bought the team in 2005. The Bees will draw about 500,000 fans this season (average: 6,785), ranking seventh in the 16-team PCL. Amicone has been a fixture in pro and college sports in Salt Lake City for 40 years, after playing baseball for Granger High School and the University of Utah.